One of Scottish Stained Glass’s specialties is repairing antique stained glass panels, including re-leading, replacing broken glass, and cleaning and polishing to restore an old stained glass masterpiece to its original glory. This type of restoration could definitely be considered an art form, completely separate from that of creating new stained glass. Matching the precise size and shade of the missing or broken glass requires a trained, expert eye. Installing new glass pieces into an antique panel so that it is undetectable from the original glass is highly detailed hand labor that only a real master of the art could accomplish. Another thing we are frequently asked to do is create brand new windows that replicate traditional antique styles, as in the photos above. Stained glass has been around for centuries, and through the ages there were many masters who created exquisite pieces of art. If you’ve seen a photo or know of an antique window that you would love to have in your home, contact us. Our designers and craftsmen would love to work with you to see your inspiration come to life. Stained glass is not new to Houston. Many older homes had beautiful leaded glass or beveled glass windows. Some were clear, others made with bright colors in the Art Deco, Frank Lloyd Wright, Floral or Mackintosh styles. If you have come into the possession of such a home, please know that these windows should be considered pieces of art. If broken or crumbling, they can indeed be repaired. 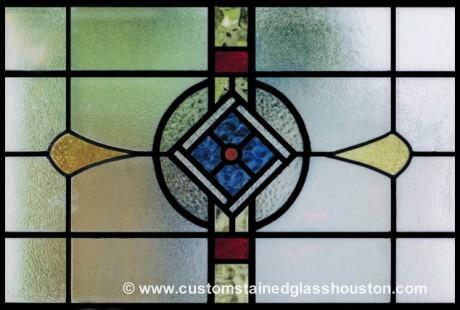 Scottish Stained Glass, Houston, is delighted to work with homeowners to restore their original stained glass windows, family heirlooms, or even stained glass lamps. The restoration process for antique stained glass is quite complex. First, all the old lead is removed. This separates the glass pieces which are then cleaned, sometimes removing many years’ worth of grime, paint, or any residue that might have built up on the windows over time. Once this is complete, the pieces are reassembled, re-leaded, polished and reinforced for extra strength and durability. Although you might have had a single stained glass panel in your windows, we will not re-install it that way. We will first install a modern clear glass window, and then bond the antique stained glass to it for protection. There are several ways to go about this process. Perhaps you’d like a new window based on a design which might have been in your home previously? 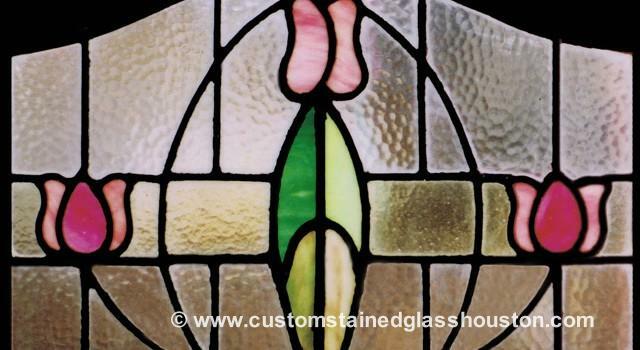 Or, if you have an older home, our design team will research the type of stained glass that was popular when it was built; ensuring that the piece we create is the appropriate style for your house. As always, the choice of design, period and pattern, colored or clear, beveled or textured, is entirely up to you. Our designers will offer suggestions and advice to assist you in your decision. Are you inspired by the beauty and craftsmanship of ancient stained glass, but never thought you could ever have anything that magnificent in your home? Please contact us today for an estimate, or to have our designers visit you at your home, at no charge.